My dad’s birthday was coming up so, inspired by this thread on Chowhound, I bought the Black Forest Cake from Thierry downtown. I saw the medium sized one in the display case and the lady there said it would feed about 10-12 people. I had to feed 20, so I ordered the large ($48.95+tax). When they say large, they’re not kidding. This thing shook the counter when I put it down. It’s so big, the top of the box sorta flattened the delicate forest of white chocolate shavings on the top. This post talked about how boozy the cherries were. They were right! It turns into a bit of a mess when you cut it, with lots of chocolate pieces breaking off. Very tasty high-quality chocolate, btw. You really don’t get a sense of the size, scale and weight in photos. 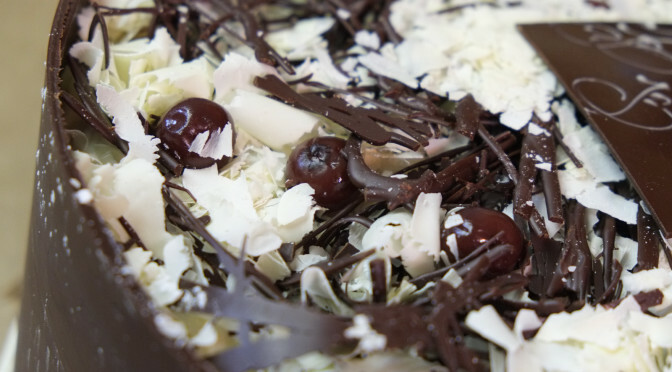 From the top we’ve got dark and white chocolate shavings, whipped cream, and alternating layers of chocolate sponge and chocolate mousse. It’s all fortified with a chocolate wall. Even if it cuts messy, the taste is just great. I’m not much of a dessert person but I enjoy desserts that aren’t too sweet and we didn’t find this cake too sweet at all. The whipped cream itself is not sweet so when eaten together with the mousse, sponge and BOOZY cherries, it all works together and it’s just awesome. Could use a bit more sponge and less mousse, but that could be said of a lot of cakes from a lot of different places. New beer! “Magic Beans” Coffee beer with @BowsXArrows Yah. Totally. Its delish. The beer was magnificent! Copious fresh-ground coffee aroma. The taste is like cold coffee, no sugar. The added carbonation of the beer made it quite an experience. I tried Gigantic Brewing’s Too Much Coffee Man beer a few days after this and I loved Brassneck’s coffee beer much much more! My sister made “The Best Chocolate Chip Cookies” using Serious Eat’s demi-god J. Kenji Lopez-Alt’s recipe. It uses brown butter and the dough needs to sit in the fridge overnight. She said it didn’t seem to turn out quite right but they looked good to me. This is what was left after feeding 20 people. We’re probably a bit less voracious cake-eaters than other families. As usual, nobody wanted to take much cake home, so I split it all up into small containers and threw it into the freezer. Don’t waste that cake! Freeze it! So we’ve been eating the frozen leftovers. If you let it defrost for ~20 minutes, you get the full flavour of the cake back! That looks awesome. You bring leftover cake and I’ll make BFC-inspired ice cream!